Budapest is a city that has a bit of a hustle and bustle feel. In navigating a city like this, it's pretty easy to stumble across beautiful parks. 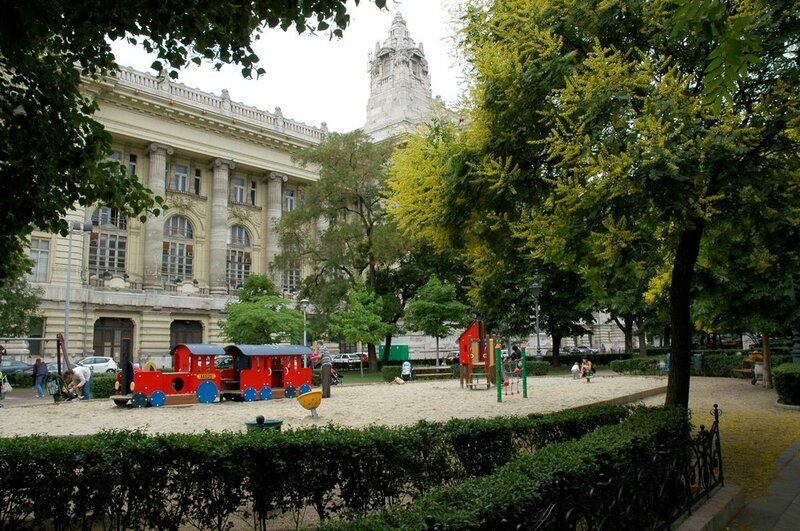 Parks are plentiful in Budapest. Honestly its as if there are parks just blocks away from one another. Here are my top 5 favorite parks to invite other mommy's and their little ones for a playdate. Which at Skyla's age... its more like a mommy playdate! Talk about a park with a view. The Danube is just in front of the park, and next door is the Budapest Parliament. You get to do a bit of sightseeing while watching your kids run around. There is a playground area and a separated grassy area for picnics. There's also a basketball court, a dog run, and even a little fountain splash area for the kids. They call it Olimpia park because of the Olympic rings which are just outside the gate of the park and can be seen from the Danube river. 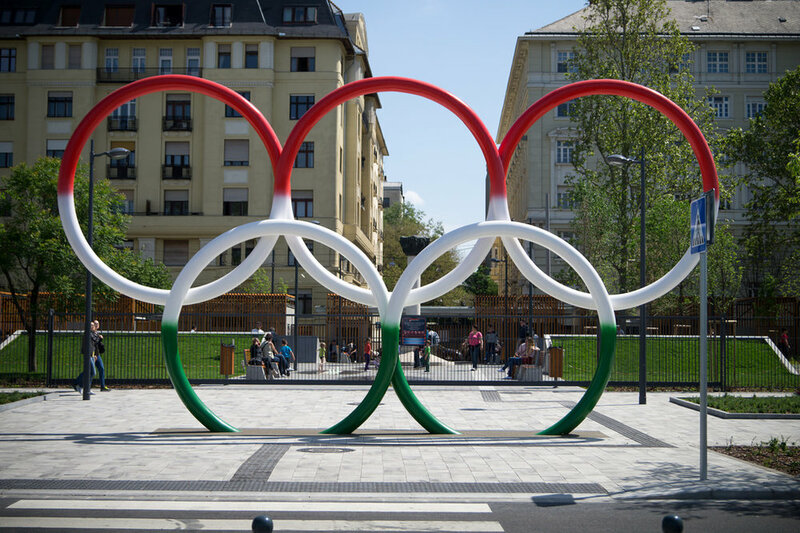 Fun Fact: The Olympic rings which are painted in the colors of the Hungarian flag, were built to impress the Olympic committee. It was an initiative to have Budapest considered as the host city for the Games in 2024. Budapest was in the running with Los Angeles and Paris, but ultimately lost to Paris. My girlfriend took me here on a mommy playdate and we loved it! The park sits on the bank of the Danube and is right off the lovely neighborhood of Pozsonyi. Great street for a stroll. Anyway, the gardens are beautiful with tons of benches, a dog run, a playground, and a beautiful fountain! If you need to beat the heat or escape the brisk cold weather then head into one of my favorite mommy cafes for a snack at the Pozsonyi Pagony Bookstore Cafe just down the road. Or grab a mommy cocktail at Babka. They had amazing #mocktails for us breastfeeding mommy's. Szabadság square is filled with monuments and statues. Also surrounding the square are beautifull architectural buildings. Pssst... make sure you look up. This square is one of my favorites as its just a couple of blocks away from the Parliament, and the touristy area of Deak Fernc Square. 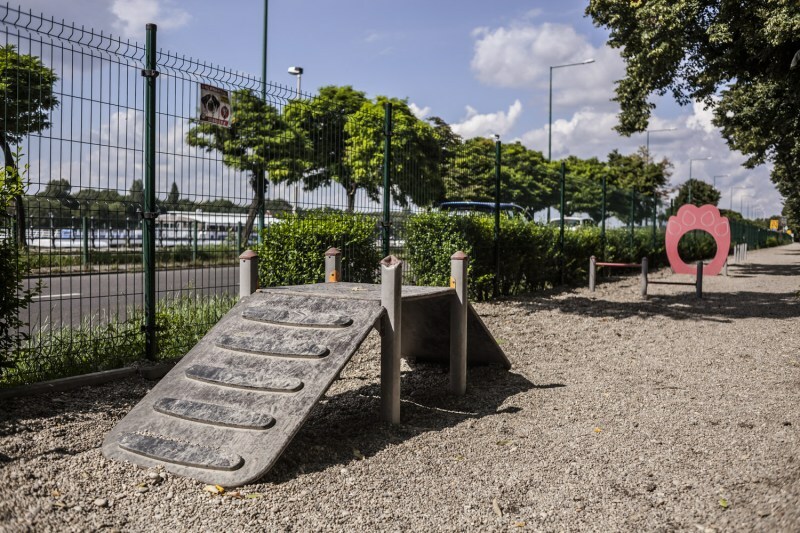 The two playgrounds are separated by equipment suited for tolders and older kids. This is a busy square with a ton of foot traffic. So if you don't mind being amongst the city bustle then this is the park for you! They often have events in this square on the weekends. So I was brought here on a mommy playdate and I loved it. This was a central location for the both of us, so we met at the metro station and walked over. First we stopped for ice cream on the busy city street. Which we enjoyed! Yum. After the cool treat we turned the corner and came to this large Park, The park was quiet of the street noise as the beautiful buildings surround this square. Mind you this was the middle of a week day when we went, and it was full with families. I really enjoyed this park area. Its hard to explore this park in just a day. It's literally the biggest green space in Budapest, next to Margit Island. I love that there are so many different areas in city park to explore. It even changes up seasonally. Ice skating in the winter, and skate parks in the summer. Depending on the age of your kiddo. The zoo is in this area, there is a trampoline section, a pond to feed the ducks, gosh the list just goes on and on! Did I mention the circus venue that always has various shows playing. Oh and there is the Vajdahunyad Castle that features museums and tours. Historically you have to see Hero's Square. The monuments are massive and share such beautiful history. 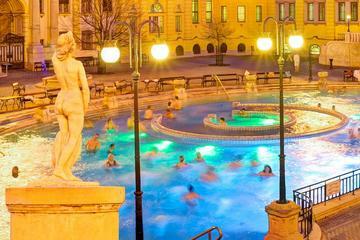 The famous Széchenyi Baths are located in this space. 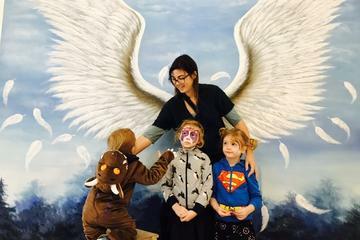 So get a sitter and do a real mommy playdate at the baths as younger kids aren't permitted. This one is pretty close to the tram and the main road, but once you enter the park the noise seems to disappear. Centered with a beautiful fountain and plenty of benches, this park is a great place to catch up with your friends. If the kiddos want to run around there are two playgrounds for them to burn off some energy. There is also an outdoor fitness area for adults. Bring your coins, because the bathrooms are pay operated and very clean. FYI: One of the top kid bookstore and cafe's is down the street called Manimiti Kucko. Pop in and tell them I sent you! The entire island is like a big park. Start with enjoying the singing fountain show that happens at the top of the hour. The manicured lawns go on for miles, and there are so many places for a picnic under a tree, if you would like you can stroll through the ruins of an old Nunnery, or even wonder through the Japanese gardens. There is a bath house on the island which has huge water slides, and an area for kids to play. Palatinus Bath house is one of the rare few that actually welcomes kids. Make it a family meet up and spend the day at the baths. The actual playground is near the end of the island near the Árpád Bridge, and can be accessed by the bus on the island. The surroundings are very green and lush but the playground area itself is very sandy. Gosh, sand is always a love hate relationship.... feels good between your toes, but gets everywhere! Playdates are fun, and help break up the day, or even the week. I hope you enjoy all of these parks, one by one. Then you can head to one of the top mommy cafe's, to unwind from the park.Which park are you going to visit first? The gallery where you learn just by having fun, while experiencing the wonders of art and also becoming a part of it. Be a professional photographer, painter, artist, editor or coreographer! Look at your own art pieces through the glass of optical illusions and three-dimensional effects.